Description : The most simple bill fold in our range. It is made out of Cow and Buffalo hides. It has a single note compartment, four card slots, and a zip pocket on the right hand side for coins. 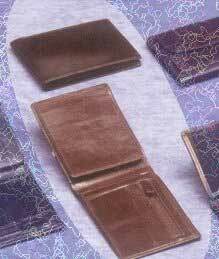 On the left hand side is a flap with a mesh window for the driving license and one side pocket.